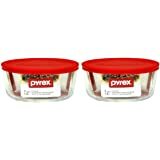 Amazon's Choice for "pyrex rectangular glass storage containers with lids"
Pyrex simply store one-piece glass rectangular food container set includes 3-cup, 6-cup, and 11-cup rectangular dishes with 3 red plastic lids. 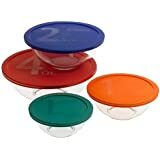 Airtight, secure-fitting lids to keep food fresher longer. Pyrex glass is non-porous, so it won’t absorb food odors, flavors, or stains. 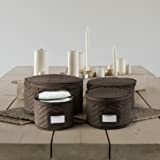 You can choose from various sizes, depending on your food storage needs and they are easily stackable to save kitchen space. Made in the USA, this set comes with a 2-year limited on the Pyrex glass and plastic lids against manufacturer defects. 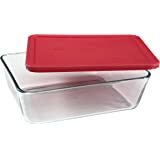 The Pyrex Simply Store 6-Piece Glass Rectangular Food Container Set includes 3-cup, 6-cup, and 11-cup rectangular dishes with red plastic lids. 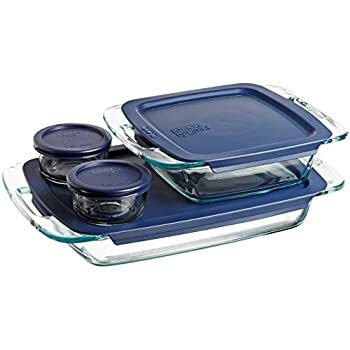 Pyrex glass is dishwasher, refrigerator, microwave, pre-heated oven, and freezer safe; lids are BPA-free and top-rack dishwasher and microwave safe. 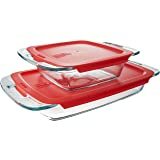 These dishes come with secure-fitting lids to keep food fresher longer. Pyrex glass is non-porous, so it won’t absorb food odors, flavors, or stains. 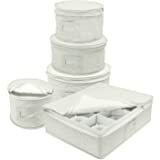 You can choose from various sizes, depending on your food storage needs and they are easily stackable to save kitchen space. 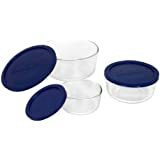 Made in the USA and comes with a 2-year limited warranty on the Pyrex glass and plastic lids against manufacturer defect. 1.0 out of 5 starsEXPLODED IN MY MICROWAVE! Only buy this Pyrex set if you’re David Blaine, because you’ll be eating glass! 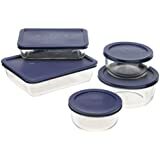 After owning this set for less than a day, I tried to microwave something at ROOM TEMPERATURE for 60 Seconds, and the container shattered into a million pieces all over the microwave! 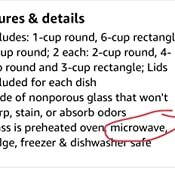 This is despite the product description that says that the containers are oven and microwave safe. 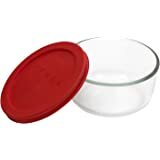 I have owned other Pyrex containers and have microwaved them with no issues, but this one blew up catistrophicaly on the very first use. 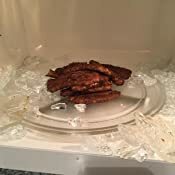 I enjoy the set, and the look of the product but I cannot stress this enough, IT LITERALLY EXPLODED IN MY MICROWAVE! This is not genuine stuff or atleast not what it use to be. This came out of the fridge (not freezer) and went into the microwave for 50 seconds. At 48 seconds it explodes. There is glass everywhere! Little tiny pieces. Took an hour to clean the microwave. I'm going back to plastic. Atleast it won't explode and kill us! 1.0 out of 5 starsDon't buy this! Unfortunately the return date had passed before I used it! Don't buy this! 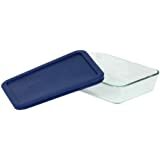 I've only used this once and when I went to bake some green beans in it it exploded in my oven when it got hot. I only had my oven up to 350 so it wasn't even that hot. 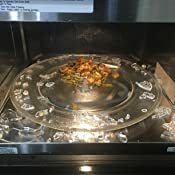 Broken glass and green beans all in the bottom of my oven! It shouldn't even get a one star rating but you have to go post a review. 1.0 out of 5 starsDangerous bowls. Most lids are broken and the bowl rims are chipping after just a few months of use. I contacted the manufacturer regarding this issue and they didn't seem to care at all. There was no concern expressed about the potential for glass being released into food. That, in my mind, is completely unacceptable. There are plenty of other glass bowl manufacturers you should give your business to before buying these! EXPLODING PRODUCTS!! DO NOT BUY!!! 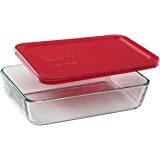 I used to be a firm believer that Pyrex was a great company with solid products that would not break from use. 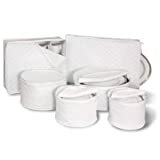 However I ordered this set a month ago. And now I'm left with only 1 storage container. They have exploded in my kitchen!!! I know not to mix hot and cold temperatures with glass, but this was ridiculous. glass at room temperature with warm soup should not have exploded. I would understand if it cracked, but it literally blew up into a million pieces, a minute after I poured the soup in. BASICALLY DO NOT BUY THESE DEFECTIVE PRODUCTS. No more pyrex for me. 1.0 out of 5 starsExploded in oven. Tried to bake in oven. 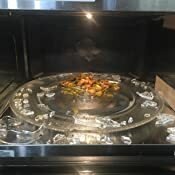 Info on item said "oven safe"?! Can't find a way to get refund, have to return...it's in pieces. 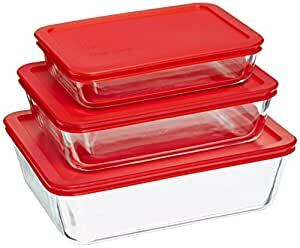 5.0 out of 5 starsGet away from plastic containers! 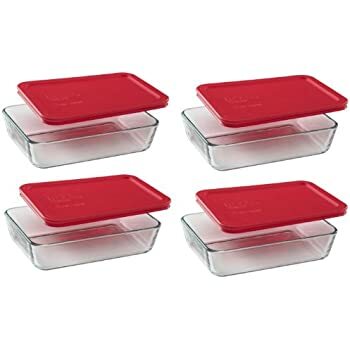 Wanting to move away from plastic storage, I have purchased multiple sets of these pyrex storage sets and used them exclusively for the last few years. Huge pros are that you can microwave them (though leave the lids off), freeze them, they are easy to see the contents in the fridge so leftovers don't get lost (I use removable painter's tape to label them as well) and I think they look nice enough to set on the table for an evening's dinner. In fact, I will frequently serve them in the storage container, and then cover and put in the fridge. Over the year's some of the lids have gotten a little warped, or ripped. Not unexpected with the amount of use they get. 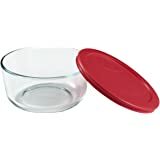 I was pleasantly surprised to see for a very reaonable price, you can purchase replacement lids directly through Pyrex. This particular order is a nice set with multiple sizes. 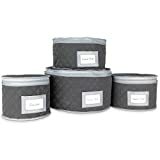 I gave one set to my mother-in-law for Christmas, and she used them all that same day to store the leftovers from her Christmas dinner!